Beastly is an amazing book, one that Alex Flinn put together like a work of art. It’s a romance, (and fiction,) and it’s one I’ll never forget. This extraordinary book is a spin off of Beauty and the Beast, but with a little more of a modern feel. 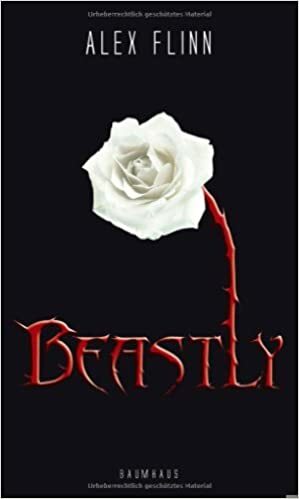 Beastly is a about a very popular guy in high school–he’s not just popular, he’s a jerk and mean to misfits. His name is Kyle Kingsbury. His father is the owner of a very popular magazine, and can only tolerate beautiful people, and his son inherits that from him. When a creepy–and ugly–goth girl confronts him, telling him he better hope he never becomes ugly, Kyle gets freaked out, and decides to pull of a nasty trick on her, at the next school dance–one that is extraordinarily humiliating for her. The night after the school dance, he returns home pumped, only to find the creepy goth girl in his bedroom, waiting for him. That night he’s transformed into a hideous beast, his beautiful and popular girlfriend ditches him, and his father sends him away to live alone in his own mansion, only a blind tutor to have as company; he’s not aloud to go outside, either. He ends up having to find true love to break the curse–but how is he supposed to do that? © 2019 Aubrey Kirk. All rights reserved.